Ever felt jealous seeing females have the ‘perfect’ nails as if they get their manicure done everyday? Ever felt like not doing absolutely any work with the fear of the effect of your freshly manicured nails to wear off? Ever worn closed shoes to avoid anyone gazing at your unevenly surfaced toenails? Well, here’s the time to say bye bye to all those chips, nicks, smudges, dry time and basically all your other nail problems forever and instead say hello to Shellac Hybrid Nail Colour Treatment! Introduced by Creative Nail Design (CND), the leader in professional nails hands and feet beauty after almost five years of research & development; Shellac Hybrid Nail Colour Treatment is the most exciting breakthrough in the history of professional nail care. What’s the specialty of this nail treatment you may ask? Well, this treatment is said to guarantee chip-proof, shiny nails with a smooth protective finish lasting flawlessly for a minimum of 14 days & maybe more if you remain careful with your nails. This treatment basically requires the application of a Shellac polish which is a ‘hybrid’ of nail polish & gel which glides on smoothly. Because of the combination of gel, the nails look extremely smooth & have a liquid finish (looks like it’s wet even though it’s not) to it which makes it look shiny. The average cost of a CND manicure is said to be around $40, more than a normal manicure but definitely worth it as even on the 14th day of application it will look like its just applied making it perfect for ladies who want their nails to look perfect in all conditions. Shellac Formula is also 3-free ie. they do not include hazardous & toxic chemicals such as Formaldehyde, Toluene or DBP (Dibutyl Phthalate). However, a low level of photo-initiators used in Shellac may lead to sensitivity with some clients. How does Shellac Hybrid Nail Treatment work? Jane Arnold, the co founder & style director of the CND Company explains how the best of both nail polish & gel helps this unique formula to work like no other polish does. Shellac contains monomers which give’s it the durability & wear of a gel and polymers which allow it to be removed safely and gently in minutes like polish. This unique formula helps it to withstand daily wear & the use of soap or other personal grooming products. She claims the Shellac application and removal process to be unbelievably fast and easy. How is Shellac Hybrid Nail Treatment applied? First the Shellac UV base coat is to be applied. Then, you can choose and get a colour applied from the 12 colours of Shellac nail paints available. They are going to launch 12 more new colours in November. After the application of a colour coat, you are required to place your hand inside a small machine which radiates a blue light. This machine is the CND UV lamp with quick colour cure technology which cures any nail problems by the radiation of UV lights. It is a small machine in which you can place five fingers or fives toes at once for the more than perfect manicures and pedicures. Then the Shellac UV based top coat is to be applied. Then again you are supposed to stick your hand inside the machine. Do not worry; you do not feel any sort of a chemical reaction on your hands or the heat from the rays. Two minutes later, once you remove your hand from the machine you will notice that the polish is fully dried involving absolutely zero drying time. Though the polish can last for longer than 14 days you will notice that your natural nails grows away from the cuticle. It is advised to remove Shellac in 14 days as the adhesion will increase after 14 days resulting in a longer removal process. An ordinary nail polish remover can not work on Shellac polish as the removal involves the usage of concentrated acetone, a cumbersome job that’s best left to the Nail Professionals. There is no filing even before application of polish, no soaking in a bowl of acetone & absolutely no damage to your natural nails in this removal process. In order to remove the Shellac polish, a cotton pad is saturated in pure acetone and placed under the nail. Then the cotton pad supposed to be folded on the top of the nail & the Shellac Removal Wrap is secured all over the finger with adhesive tab. After 10 minutes, you are supposed to twist the wrap & gently remove it. If necessary, you can gently remove any remaining product with an orangewood stick. Personally, I think it’s great for women on the go, working women & women who want to get rid of all the nail hassles especially during events like weddings. Since it’s a very recent technology this treatment probably might be available only in few big nail salons. 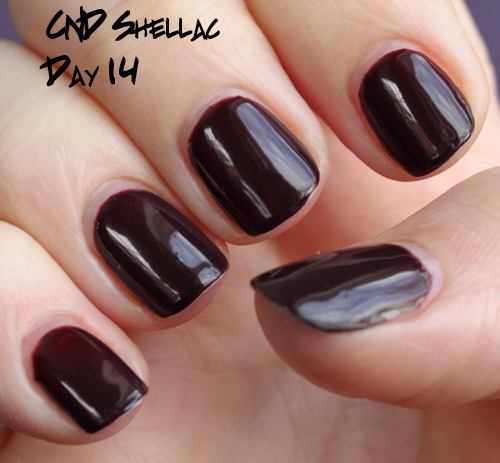 What you think of Shellac? Have you tried it or would you try it? Wow the removal process looks spohisticated!are these salons at India? I have no idea. i tried searching online but found nothing. i think u can try contacting your big nail salons of your city. they might be roviding this service. yeh even i thought the uv rays might hurt the nails or maybe the skin around the nails but i was told that it does not hurt at all atleast externally. I am not sure if this process can damage the nails in the long run if done continuosly. you if it’s allright. Could it be just me or do a few of the remarks look like left by brain dead people? 😛 And, if you are writing on other online sites, I would like to keep up with anything fresh you have to post. Could you list the complete urls of all your social sites like your twitter feed, Facebook page or linkedin profile?